Hi everyone! I'm going to post my manicure for Relay for Life tomorrow (once I fix up my cuticles a little bit more hehe), so I'm going to post a swatch of one of the prizes for the Cosmetics for a Cure raffle that ended this more. 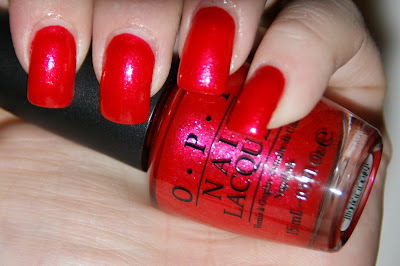 Here is one half of the OPI nail polish duo from last summer, Serena Williams Glam Slam: Love is a Racket! I'm not a person who regularly wears reds, but this had a slight blue shimmer to it that makes it perfect for me! I LOVED this nail polish and wore it for a few days before Valentine's Day! Hope you're all having a great Saturday! Can't wait to announce the raffle winners!